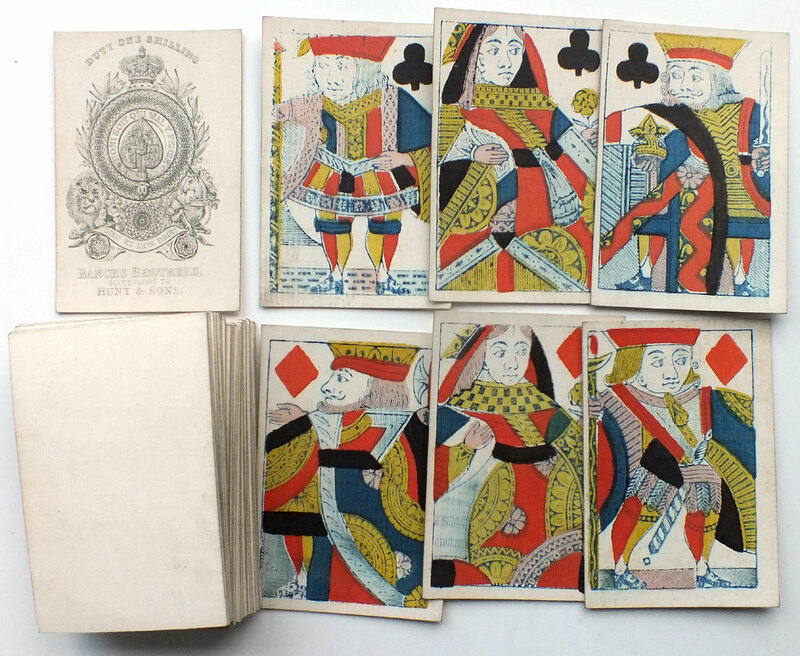 Bancks Brothers (Anthony Bancks & Robert Olddiss Bancks, card makers) were successors to Hunt & Sons (1790-c.1840) who was the first maker to 'modernise' the court card designs with a complete redrawing, in which some of the idiosyncrasies which had crept into playing card designs were rationalised. The example shown below (top two rows) dates from c.1845 and illustrates the new-style courts which had been inherited from Hunt & Sons. 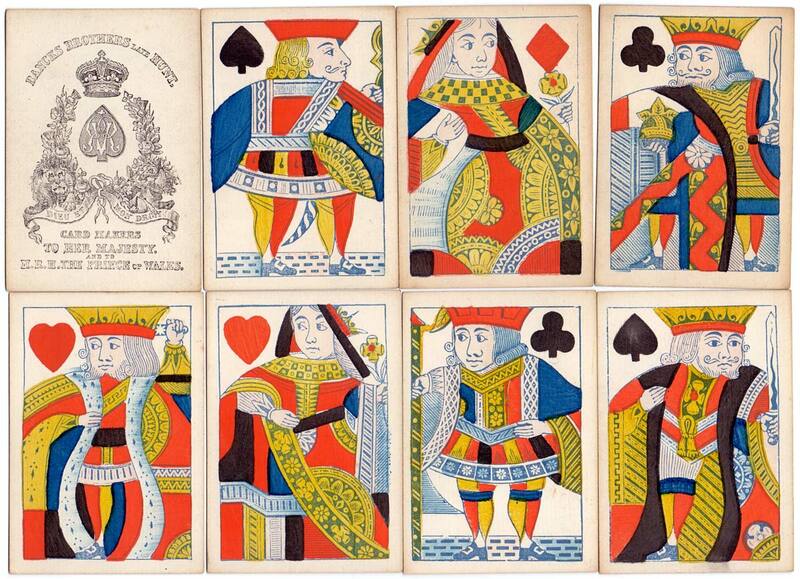 These are still full-length figures and the cards have been coloured using brush and stencils. The Jack of Hearts now holds what is clearly a leaf, rather than the top of a staff as in earlier times. The 'Old Frizzle' Ace of Spades shows the duty paid as one shilling, and the manufacturer's name is engraved at the bottom of the ace. Shortly after this, Bancks Brothers produced a double-ended version (below, bottom two rows). 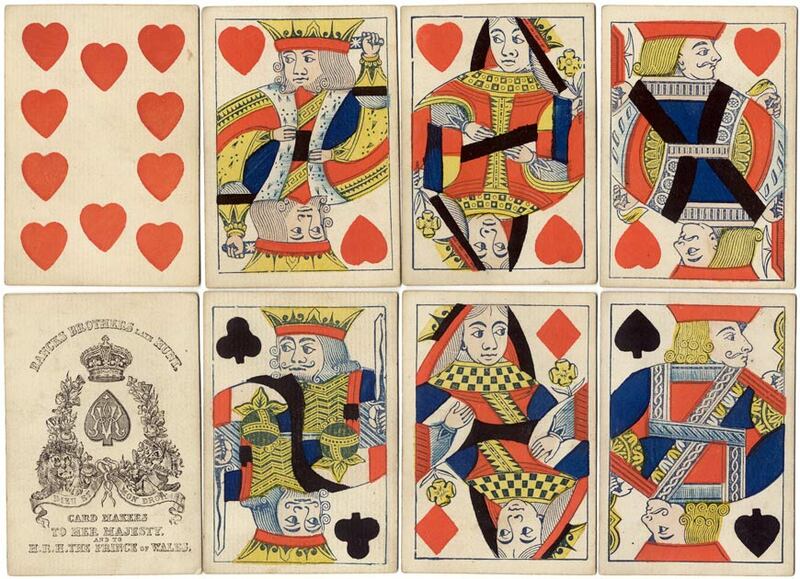 Above: single-figure cards by Bancks Brothers (successors to Hunt & Sons) with the 'Old Flizzle' duty Ace of Spades, c.1845. The Queen's noses are sometimes drawn slighly smaller, as in the example below. Above: double ended version, stencil-coloured, c.1865. Note that the pip cards are still single-ended. The Ace of Spades has the manufacturer's name around the top, and a reference to Her Majesty and H.R.H. The Prince of Wales at the bottom. In all the above examples the backs are plain white, although examples are known with dotted backs or with other patterns. There are no indices, and the corners are square. 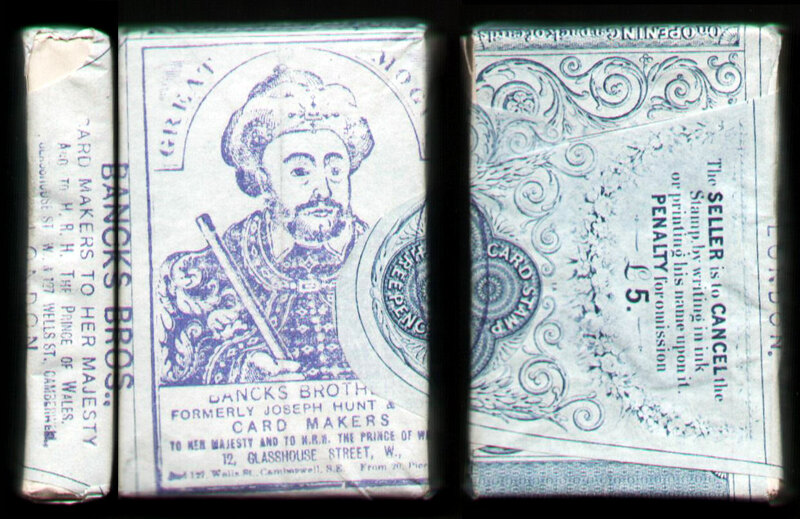 Bancks Brothers late Hunt also produced packs with back designs commemorating the Royal Wedding of the Prince of Wales in 1863 and also the special 1890 Ladies presentation pack for the Worshipful Company of Makers of Playing Cards given to the lady guests attending the Company's Ladies Dinner held in July 1890. This last deck, featuring the Ace of Spades and double-ended courts shown above, along with a special back design and red silk box, was issued in very limited numbers making it one of the rarest packs issued by the company. 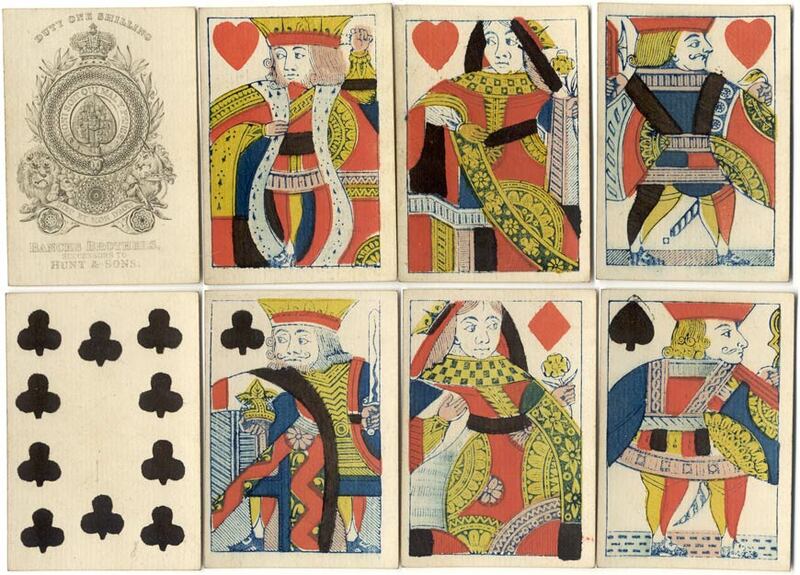 Above: later small-format cards with double-ended courts and unusual colouring of turquoise / yellow / red printed by letterpress, c.1870-80. Images courtesy John Sings. Messrs Bancks produced a wide range of back designs including coats-of-arms, floral series and oriental designs, often with gold and silver printing. 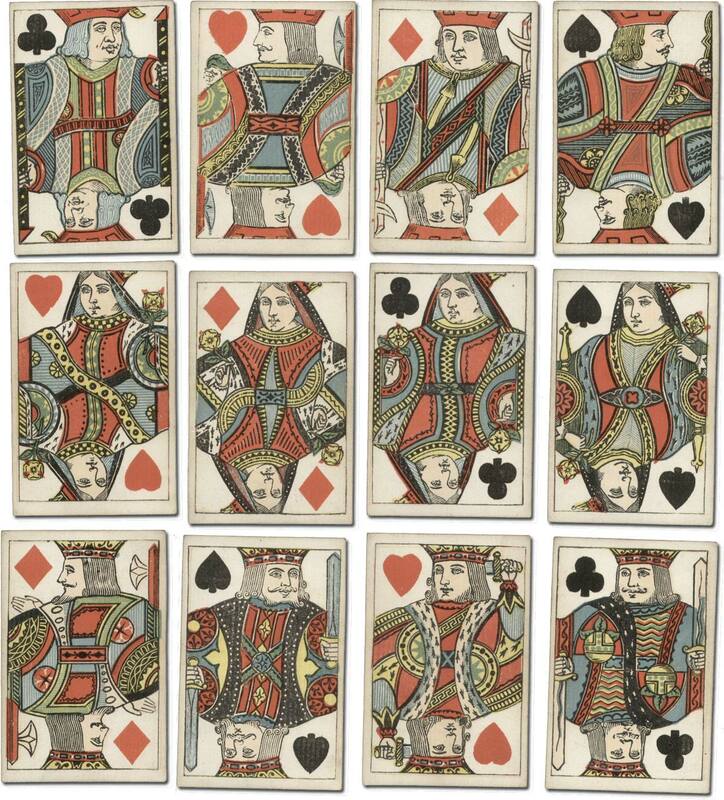 Bancks Brothers also produced an experimental, non-standard pack in around 1870, with special designs with the heads of single-ended courts and numerals inserted into large suit signs, the the value of each card printed in each corner. Packs are known with Bancks Brothers 'Old Frizzle' Aces but with Goodall courts. Apparantly Bancks Brothers had large stocks of 'Old Frizzle' Aces which were out of date for duty rebate but continued to be used until at least 1875. This suggests that an association may have existed between Bancks Brothers and Goodall around this time. R.O. Bancks, the surviving partner of Bancks Brothers, died in 1886 and the business was subsequently sold to George Clulow's son. George Clulow was a partner and later a director of Charles Goodall & Son.